"Chattahoochee" redirects here. For other uses, see Chattahoochee (disambiguation). Map of the Apalachicola River system with the Chattahoochee highlighted in dark blue. The Chattahoochee River forms the southern half of the Alabama and Georgia border, as well as a portion of the Florida - Georgia border. It is a tributary of the Apalachicola River, a relatively short river formed by the confluence of the Chattahoochee and Flint rivers and emptying from Florida into Apalachicola Bay in the Gulf of Mexico. The Chattahoochee River is about 430 miles (690 km) long. The Chattahoochee, Flint, and Apalachicola rivers together make up the Apalachicola–Chattahoochee–Flint River Basin (ACF River Basin). The Chattahoochee makes up the largest part of the ACF's drainage basin. The source of the Chattahoochee River is located in Jacks Gap at the southeastern foot of Jacks Knob, in the very southeastern corner of Union County, in the southern Blue Ridge Mountains, a subrange of the Appalachian Mountains. The headwaters of the river flow south from ridges that form the Tennessee Valley Divide. The Appalachian Trail crosses the river's uppermost headwaters. The Chattahoochee's source and upper course lies within Chattahoochee National Forest. From its source in the Blue Ridge Mountains, the Chattahoochee River flows southwesterly to Atlanta and through its suburbs. It eventually turns due-south to form the southern half of the Georgia/Alabama state line. Flowing through a series of reservoirs and artificial lakes, it flows by Columbus, the second-largest city in Georgia, and the Fort Benning Army base. At Columbus, it crosses the Fall Line of the eastern United States. From Lake Oliver to Fort Benning, the Chattahoochee Riverwalk provides cycling, rollerblading, and walking along 15 miles (24 km) of the river's banks. Farther south, it merges with the Flint River and other tributaries at Lake Seminole near Bainbridge, to form the Apalachicola River that flows into the Florida Panhandle. Although the same river, this portion was given a different name by separated settlers in different regions during the colonial times. The name Chattahoochee is thought to come from a Muskogean word meaning "rocks-marked" (or "painted"), from chato ("rock") plus huchi ("marked"). This possibly refers to the many colorful granite outcroppings along the northeast-to-southwest segment of the river. Much of that segment of the river runs through the Brevard fault zone. 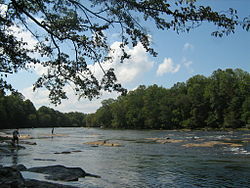 A local Georgia nickname for the Chattahoochee River is "The Hooch". The vicinity of the Chattahoochee River was inhabited in prehistoric times by indigenous peoples since at least 1000 BC. The Kolomoki Mounds, now protected in the Kolomoki Mounds Historic Park near present-day Blakely in Early County in southwest Georgia, were built from 350 AD to 650 AD and constitute the largest mound complex in the state. Among the historical Indigenous nations, the Chattahoochee served as a dividing line between the Muscogee (Creek) (to the east) and the Cherokee territories (to the west) in the Southeast. The Chattahoochee River became the dividing point for the Creek Confederacy, which straddled the river and became known as the Upper Creek Red Sticks and the Lower Creek White Sticks. The United States accomplished the removal of Native Americans, to extinguish their claims and make way for European-American settlement, through a series of treaties, land lotteries, and forced removals lasting from 1820 through 1832. The Muscogee were first removed from the southeastern side of the river, and then the Cherokee from the northwest. The Chattahoochee River was of considerable strategic importance during the Atlanta Campaign by Union General William Tecumseh Sherman of the American Civil War. Between the tributaries of Proctor Creek and Nickajack Creek on the Cobb and Fulton county lines in metropolitan Atlanta, are nine remaining fortifications nicknamed "Shoupades" that were part of a defensive line occupied by the Confederate Army in early July 1864. Designed by Confederate Brigadier General Francis A. Shoup, the line became known as Johnston's River Line after Confederate General Joseph E. Johnston and is listed on the National Register of Historic Places. A month prior to the Battle of Atlanta, Shoup talked with Johnston on June 18, 1864 about building fortifications. Johnston agreed, and Shoup supervised the building of 36 small elevated earth and wooden triangular fortifications, arranged in a sawtooth pattern to maximize the crossfire of defenders. Sherman tried to avoid the Shoupade defenses by crossing the river to the northeast. The nine remaining Shoupades consist of the earthworks portion of the original earth and wooden structures; they are endangered by land development in the area. Two of the last battles of the war, West Point and Columbus took place at strategically important crossings of the Chattahoochee. Since the nineteenth century, early improvements and alterations to the river were for the purposes of navigation. The river was important for carrying trade and passengers and was a major transportation route. In the twentieth century, the United States Congress passed legislation in 1944 and 1945 to improve navigation for commercial traffic on the river, as well as to establish hydroelectric power and recreational facilities on a series of lakes to be created by building dams and establishing reservoirs. Creating the manmade, 46,000-acre Walter F. George Lake required evacuating numerous communities, including the historically majority-Native American settlement of Oketeyeconne, Georgia. The lakes were complete in 1963, covering over numerous historic and prehistoric sites of settlement. Beginning in the late twentieth century, the nonprofit organization called "Upper Chattahoochee Riverkeeper" has advocated for the preservation of the environment and ecology of the northern part of the river, especially the part traversing Metropolitan Atlanta. In 2010, a campaign to create a whitewater river course was launched in the portion of the Chattahoochee River that runs through Columbus, Georgia. Between 2010 and 2013, construction took place on the river, the Eagle and Phenix and City Mills Dams were breached and a 2.5 mile Whitewater Course was formed in Uptown, Columbus. The project returned the river to its natural path across the Fall Line, as well as creating the longest urban whitewater course in the world. Several large manmade reservoirs, including Lanier, Walter F. George, West Point, and George W. Andrews, lakes are controlled by the United States Army Corps of Engineers. The dams and reservoirs were developed following legislation by Congress of the mid-1940s for flood control, domestic and industrial water, hydroelectricity, recreation, and improved navigation for river barges. Most of the lakes were completed by 1963. Numerous historic and prehistoric sites were covered over by the lakes during the flooding of the reservoirs, including Oketeyconne, Georgia. The Georgia Power Company also owns a small series of dams along the middle portion of the river (the Columbus area) between West Point Lake and Lake Walter F. George. Several smaller and older lakes and dams also provide these services on a much smaller and more localized scale, including Bull Sluice Lake, which is held by the Morgan Falls Dam. This dam was built by the Georgia Railway and Power Company in 1902 to provide electric power for the Atlanta trolley system, which has long since been replaced by other forms of transportation. At various points, the Chattahoochee serves as the boundary between several counties and cities, as well as forming the lower half of the boundary between Alabama and Georgia. The Ramblin' Raft Race, an annual event in Atlanta, was cancelled in 1980 due to environmental concerns. Atlanta is built upon the crest of a large ridge, rather than in the floodplain of the river. This has contributed the preservation of much of the natural scenic beauty of the section that runs through metropolitan Atlanta. North of the metropolis, the Chattahoochee River National Recreation Area protects other portions of the riverbanks in a region that is spread across several disconnected areas. The river traverses much of Atlanta's hilly topography of the northern suburbs. Wealthy suburban communities in northern metro Atlanta that abut the river include: Vinings, Buckhead, Sandy Springs, East Cobb, Roswell, Dunwoody, Peachtree Corners, Johns Creek, and Berkeley Lake. Since three states have needs related to the river, there has been increasing controversy since the late twentieth century related to competing development among the regions and the implications for the river. The enormous growth of metropolitan Atlanta has increased its water withdrawals from the river. This has effects downstream. For example, the oysters in the Apalachicola Bay of Florida depend on the brackish water mixture of river and ocean water, and the alternating freshwater and saltwater flows that the river and the tides provide. The amount of flow in the Chattahoochee has also been decreased by interbasin water transfers, where water is withdrawn from the Chattahoochee, but discharged as treated sewage water into another river, such as the Oconee River, which flow to the Atlantic Seaboard via the Altamaha River. The second most recent major flood along the river occurred during the 2009 Georgia floods, with 28.10 feet (8.56 m) of water recorded at Vinings at the northwestern Atlanta city limit. The flood was over 5 feet (1.5 m) higher than the previous flood recorded in September 2004, as a result of Hurricane Fred. Numerous tributaries also swelled far over and beyond their banks. These were the highest water levels seen since 1990, and the second-highest ever since the large Buford Dam was built upstream. The National Weather Service in Peachtree City estimated that this was a 500-year flood event. at George W. Andrews Lake & dam (USACE) south of Columbia, Alabama then in November 2009 it flooded Vinings again. Water-level forecasts are regularly issued only at Vinings and Atlanta. Forecasts are issued only during high water at Norcross, Whitesburg, West Point, and the Lake Walter F. George and Andrews Dams. All other locations have observations only. The beauty of the Chattahoochee River is commemorated in the epic poem The Song of the Chattahoochee (1877), by the noted Georgian poet Sidney Lanier. Lake Lanier on the Chattahoochee is named for him. Country music artist Alan Jackson released his song "Chattahoochee" in 1993 as a single off his album A Lot About Livin' (And a Little 'bout Love). "Chattahoochee" received Country Music Association awards for Single of the Year and Song of the Year. ^ a b c d "Chattahoochee-Flint River Basin". River Basin Center. Archived from the original on June 9, 2010. Retrieved 4 August 2010. ^ "Water resources data for the United States, Water Year 2009; gage 02343801, Chattahoochee River near Columbia, GA" (PDF). USGS. Retrieved 4 August 2010. ^ "EPA MyWaters Mapper". Environmental Protection Agency. Retrieved 2015-12-03. ^ "Geographic Names Information System (GNIS)". USGS. Retrieved 2015-12-03. ^ Barnett, Cynthia (2011-09-20). Blue Revolution: Unmaking America's Water Crisis. Beacon Press. ISBN 9780807003183. ^ "Chattahoochee River". New Georgia Encyclopedia. Retrieved 27 November 2010. ^ "Kolomoki Mounds". New Georgia Encyclopedia. Retrieved 27 November 2010. ^ Hatch, Thom (2012). Osceola and the Great Seminole War. New York: St. Martin’s Press. pp. 18–19. ^ "Land Lottery System". New Georgia Encyclopedia. Retrieved 27 November 2010. ^ "Endangered Sites". Georgia Battlefields Association. Archived from the original on September 21, 2010. Retrieved 27 November 2010. ^ "The Song of the Chattahoochee". About North Georgia. Retrieved 27 November 2010. ^ "Alan Jackson Biography". About.com. Retrieved 2007-08-07. Wikimedia Commons has media related to Chattahoochee River.